marital bless: You've got to be kidding me! We've been prepping our neighbors for a few weeks now that we'll be installing our wood privacy fence on our entire property. 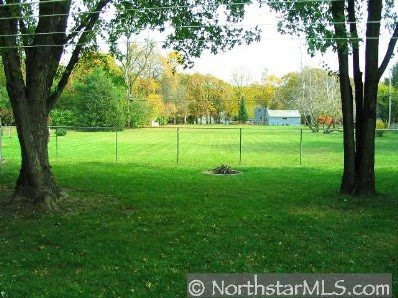 As it stood only 1/2 of our backyard was fenced in 3/4 with privacy, lopped off the back end with chain link . . . meaning we were not using 1/2 of our backyard! All of this unused!!! Please forgive the brown, we were terribly dry last summer! But our neighbors have been using our lot. 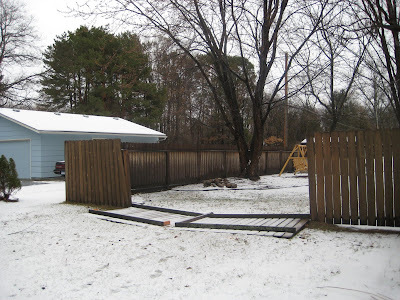 We've frequently had people trespass through our property and play ball in the backyard, thus the need for a new fence. Of course there is also the fact that it was completely rotted out as well thus the 2 sections that literally fell over this spring. Unfortunately, apparently some husbands do not talk to wives, because just last night DH got an earful from one of our neighbors.She actually had the audacity to tell DH that she would rather we install a chain link fence. As she could live with chain, but that she's lived in their house for 24 years and likes her view . . . of our backyard. I couldn't believe it! Where was the understanding that it's OUR property! Are you freaking joking? I'm sorry, 24 years or not, you do not get a say in what we do with our land! They also demanded a lawn mower easement . . . one that the city does not specify. According to our city rules, our fence need be only 1 inch off of the property line! I can't believe the gall of some people. It did remind me though of a comment she made last year, about how our tree planting would improve her view. As if we did it with her in mind! Gah! Selfish people in the world never cease to amaze me. Seriously. That is ridiculous. Lol Andrea - That's exactly how Ton and I feel! Julia - I totally get that she's used to her view . . . but c'mon! To actually voice an opinion of what we should do with our property?! All the more reason to put a fence up. Yes ma'am. They're going to have to find somewhere else to play ball and trespass. Just the way it is. They'll survive and you will be able to enjoy your WHOLE yard! Your backyard is amazing! So jealous! Who cares what your neighbor thinks. Next time she gives you attitude, tell her you put up the fence to block her out! Our neighbor is like, amazing isn't it?